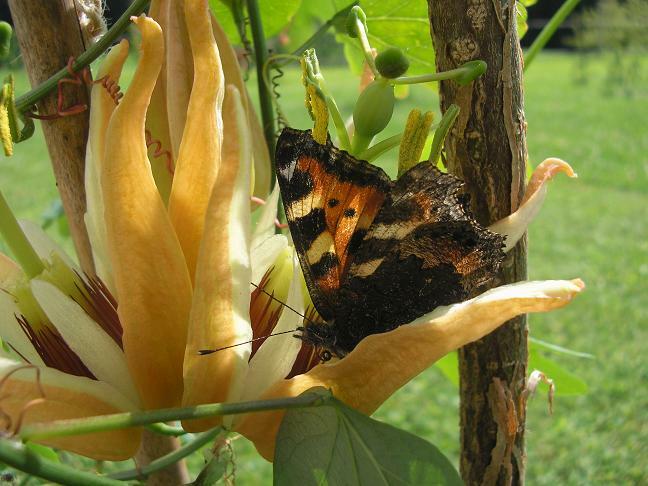 Some butterflies visit Passiflora to drink nectar from the flowers and some also may eat the pollen, in doing so they may also pollinate the flowers. 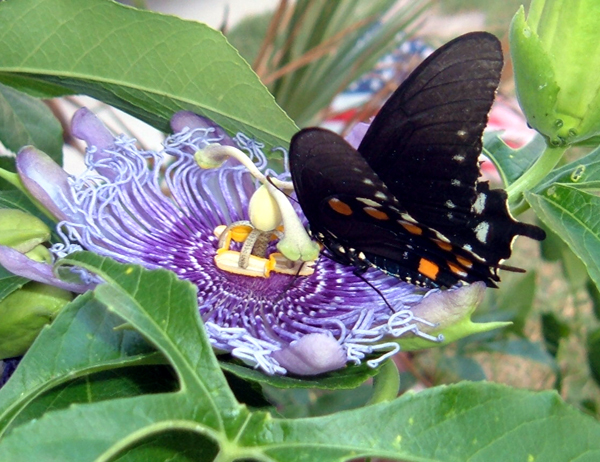 We all love butterflies but their caterpillars can wreak havoc, rapidly defoliating and sometimes killing Passiflora. 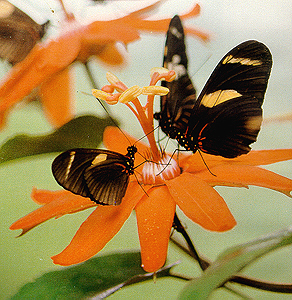 There is a special relationship between Passiflora and the Heliconius butterflies, also known as longwings, that demonstrates the complexity of the ongoing battle. 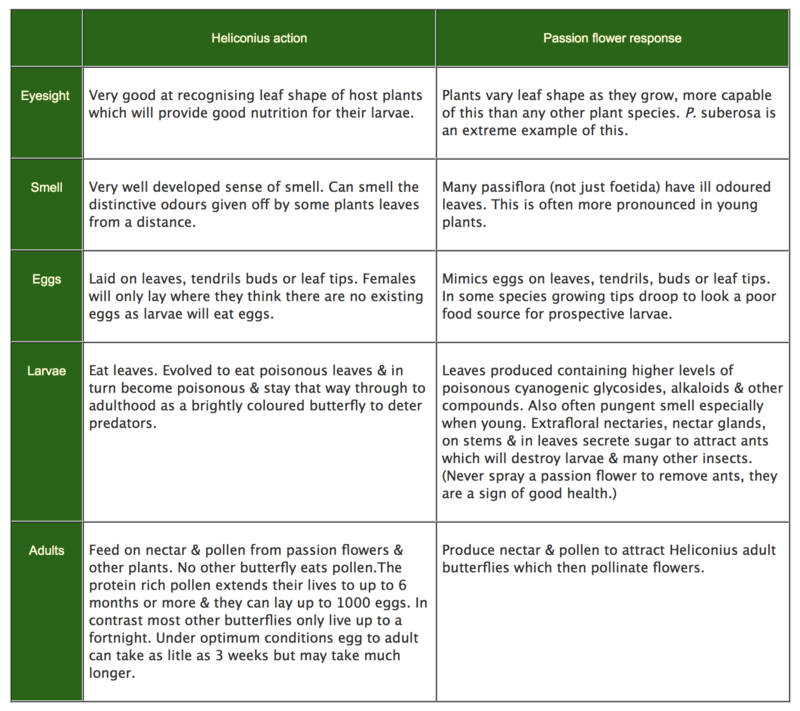 Ken Smith’s site has some beautiful pictures of Heliconius and also advises which host Passiflora each of them prefer. 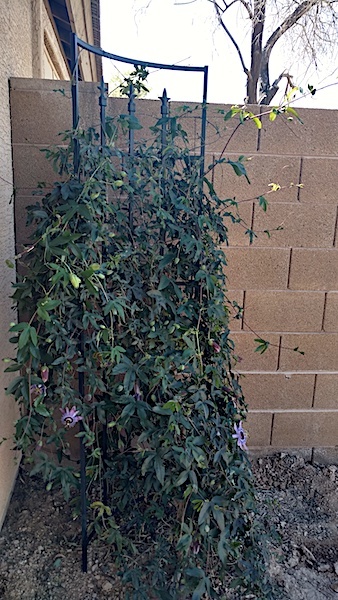 These pics © Daryl Draper 2018 show Passiflora ‘Betty Myles Young’ totally defoliated by caterpillars in two weeks. 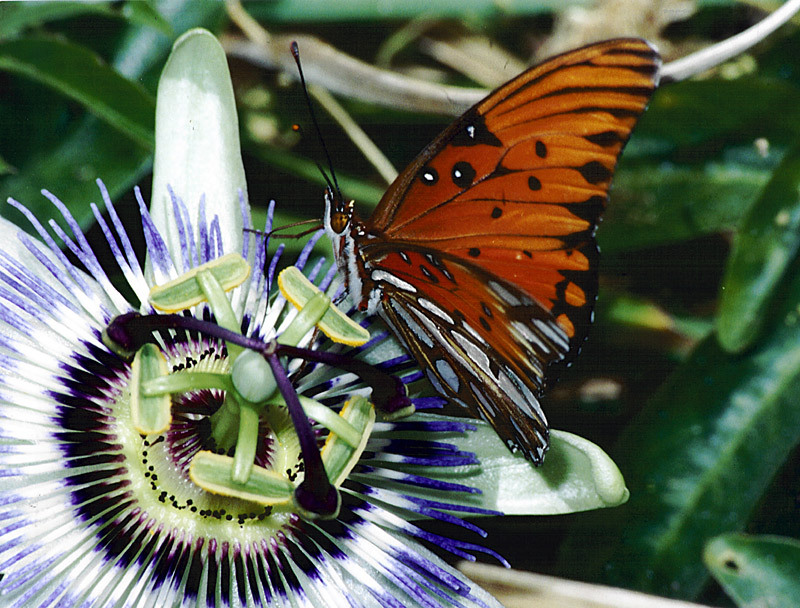 If your Passiflora are being destroyed by butterfly caterpillars, such as the Gulf fritillary, Agraulis vanillae, above, eating them, pick some/all off by hand wearing suitable protection. Warning! While caterpillars are quite safe if you leave them alone, many caterpillars have urticating (irritating) hairs either by touch or inhalation. To avoid problems wear protective gloves, cover your arms and ideally also wear a mask and cover the eyes. 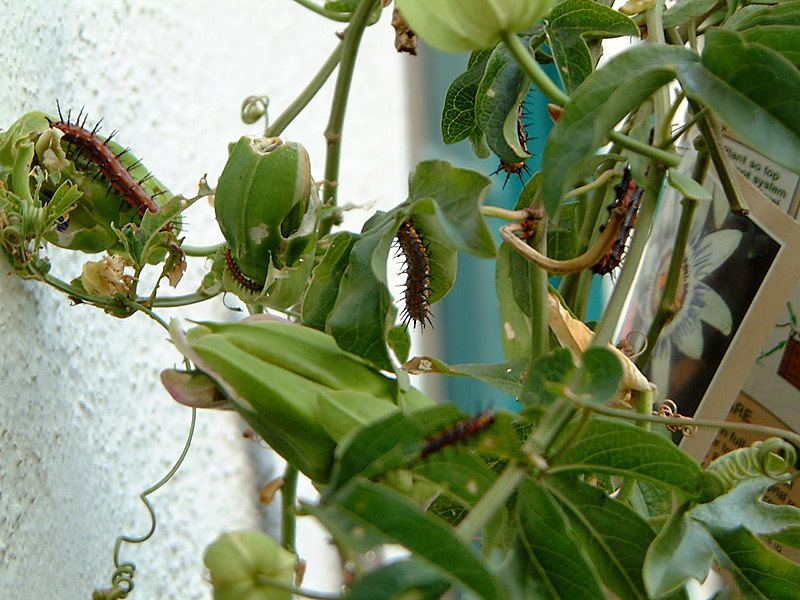 This sounds a bit extreme but some allergic reactions to caterpillars can be quite severe. 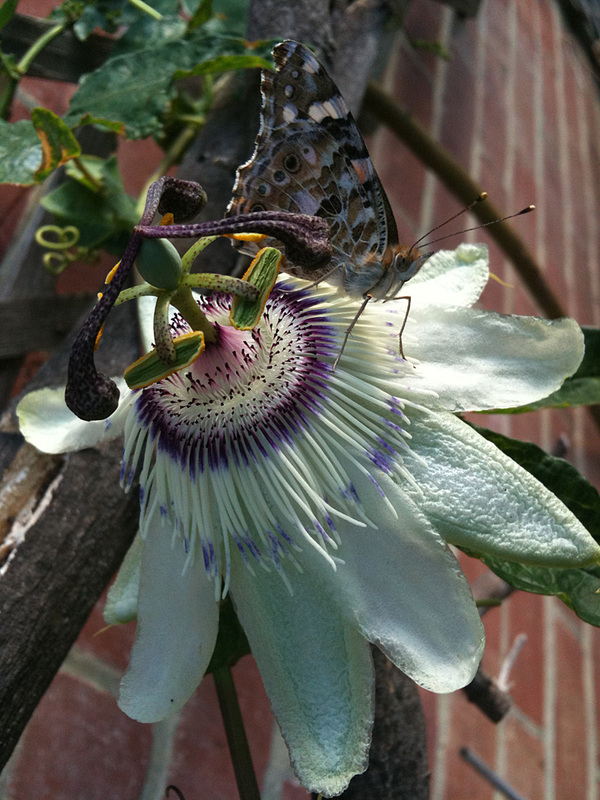 Rather than kill the caterpillars try to keep one or two large Passiflora that they can eat without you worrying. Remember no caterpillars = no beautiful butterflies! 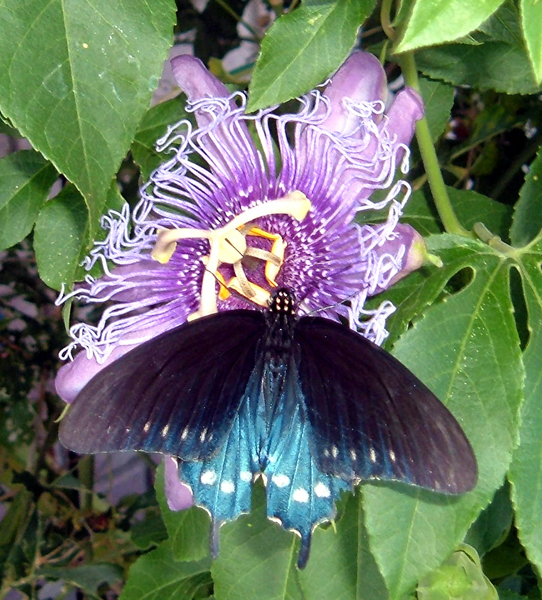 There is an extraordinary special relationship between Passiflora and the Heliconius butterflies known as Longwings, Nymphalidae, Heliconiinae, Heliconiini. Theirs is a uniquely uneasy relationship however with a constant battle of wits as above. 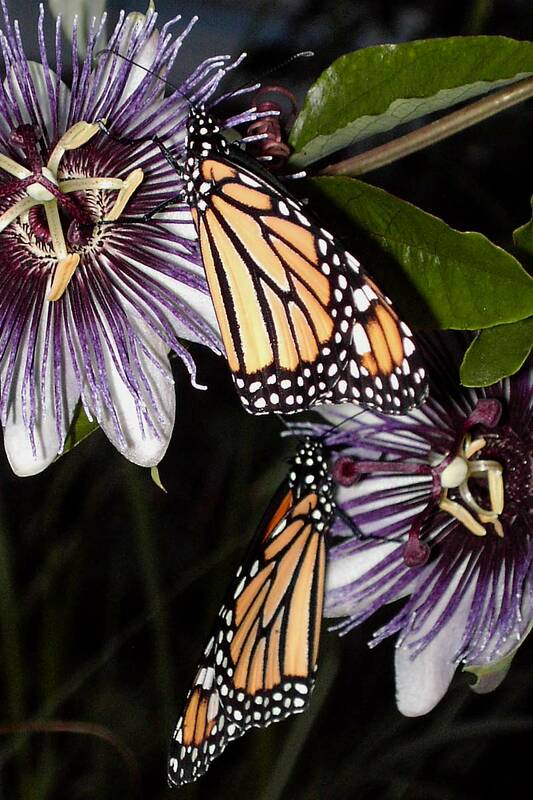 These beautiful insects, which often appear to fly in slow motion, on occasion lay their eggs on passion flowers. 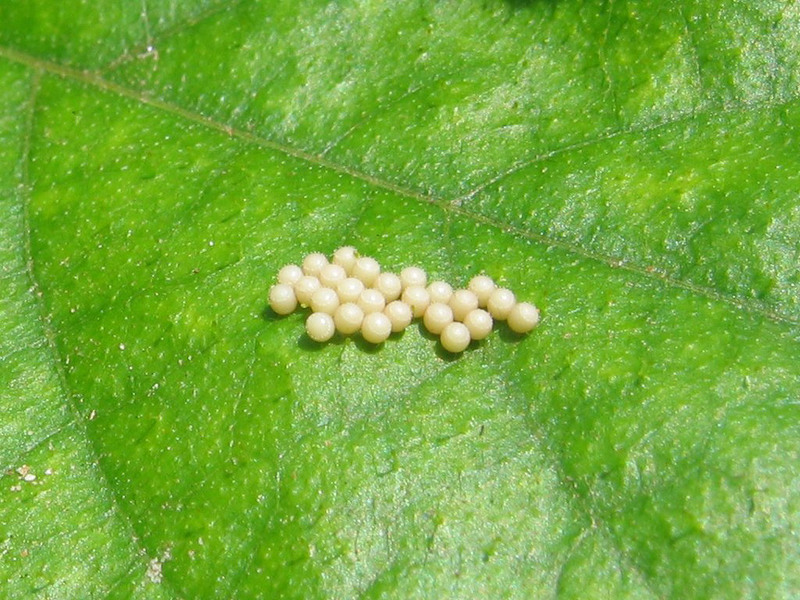 The eggs are usually laid singly, though sometimes in groups. 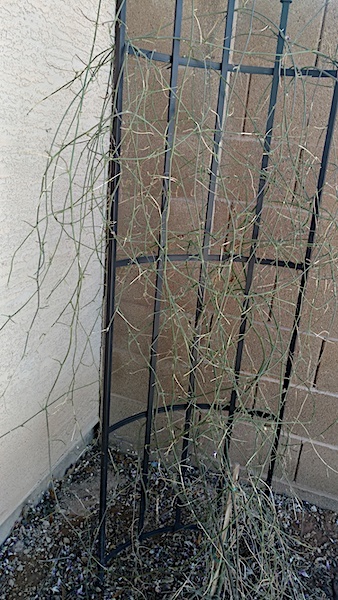 The caterpillars, which may have irritant spines, then hatch out & eat the leaves of the plant. In sufficient numbers they will destroy it. At the same time however in some species the adults may rarely pollinate the flowers. They are the only butterflies that both eat pollen and drink nectar and may live for up to 9 months. I am greatly indebted to Dr L. E. Gilbert for his assistance in updating the information on this page. 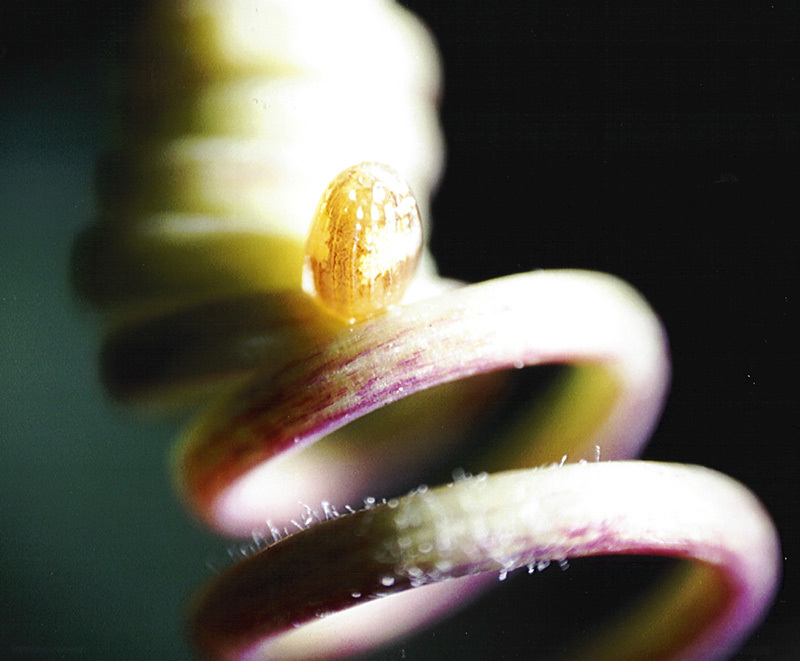 Heliconius egg mimicry, yellow egg-like structures or spots (about 1 mm diameter) on the leaves, stipules, bracts, tendrils etc and growing tips as shown above on P. actinia. Any butterfly that sees eggs from another butterfly on a plant will not lay its own eggs as they would hatch after the ones already there and would have little food i.e. leaves to eat. More importantly Heliconius caterpillars are aggressively cannibalistic both towards other younger caterpillars and indeed eggs. 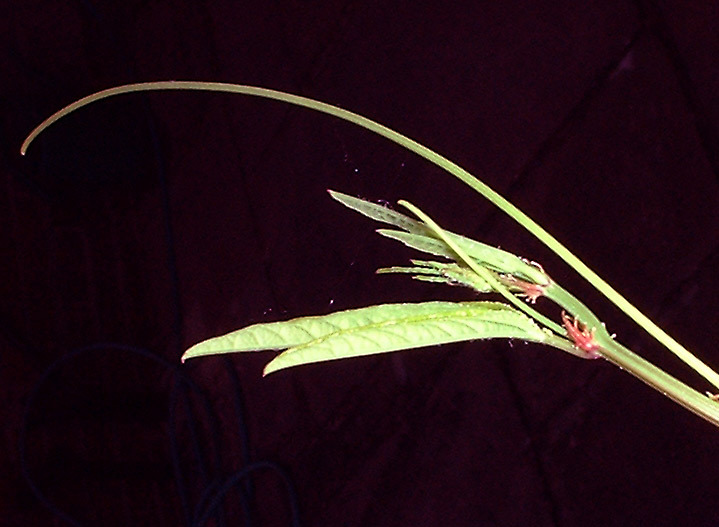 In the case of P. pinnatistipula perhaps another tactic, mimicry of an insect predator which might eat the eggs. Butterflies have very sharp eyesight and look for leaf shapes that match their template of what a suitable plant for egg laying should look like. 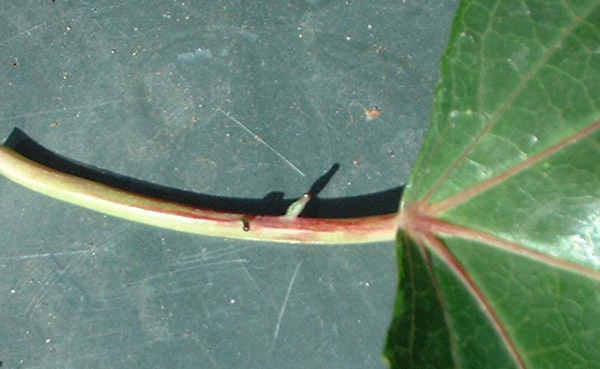 A number of Passiflora change their leaf shape to try to throw them off the track. P. suberosa is well known for this and there are a nice sequence of different leaf shapes on P. colinvauxii here. Even the Common Passion Flower P. caerulea varies its number of leaf lobes. 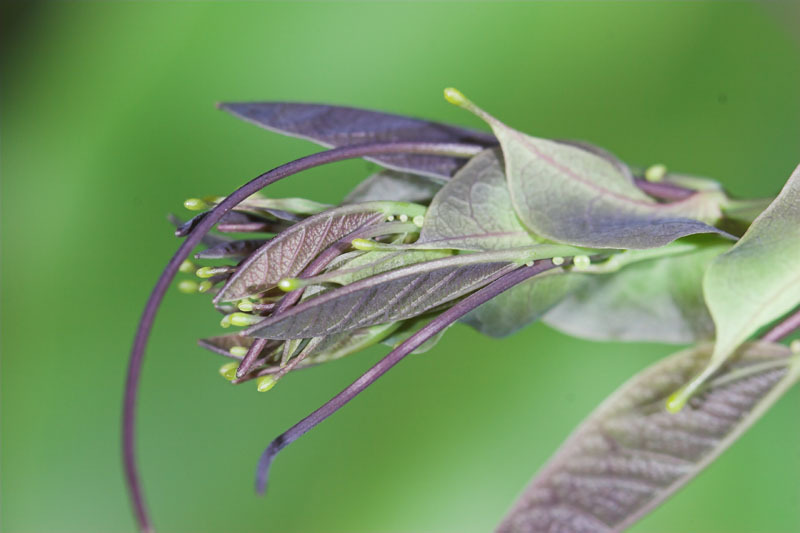 Many Passiflora produce nectar both in the floral nectaries, and at extra-floral nectaries such as the petiole glands above. 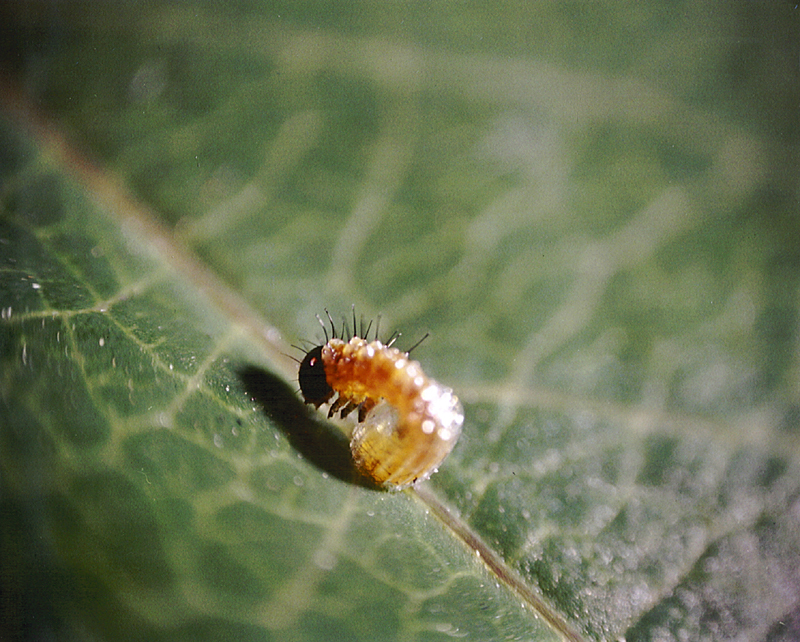 These are very attractive to ants and Smiley (1985) suggests that the presence of ants increases caterpillar mortality. Trichomes are epidermal outgrowths on plant foliage which are often hair or scale like. 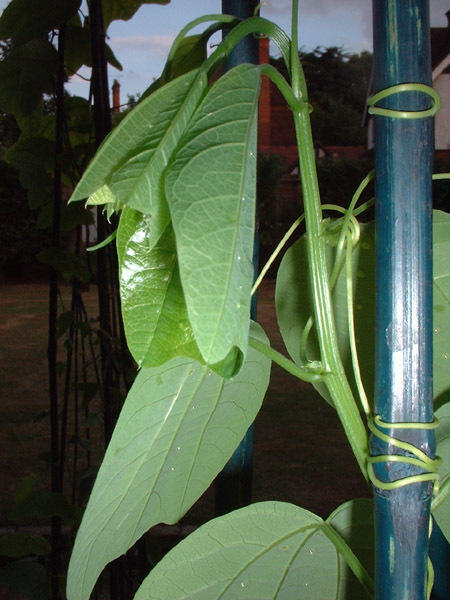 In the case of a very few Passiflora, such as P. adenopoda and P. lobata, they are hooked hairs. Engler, H. Spencer, K. & Gilbert, L.E. (2000) Insect metabolism. Preventing cyanide release from leaves Nature 406: 144. Gilbert, L.E. 1982 The coevolution of a butterfly and a vine. Scientific American 247:110-121.